Team boss Carl Johnson wants Panthers to put the spark back into their season. Johnson is placing plenty of significance on an SGB Championship trip to Redcar tonight (Thursday, 7.30pm) and a home date against bottom side Berwick on Sunday (5pm). Panthers made a terrific start to 2017 by winning five of their opening six meetings, but their campaign has lost serious momentum since then. They’ve managed to win only one of their last half-a-dozen outings after being hit by injuries, a loss of form and a series of postponements. But now Johnson is adamant a side, spearheaded by major signing Chris Harris, can kick their challenge for the play-offs back into gear as they go into both fixtures at full-strength. He said: “It’s an important few days for us. “The season started very well. We were winning meetings even though we knew there was still potential for a lot more improvement. “But for the last few weeks things have not gone our way at all. We’ve had riders out injured, we’ve had others unavailable and we’ve been without our full one-to-seven. “But we’re back to full strength now, we’ve made a change to bring Chris in, and we’re all looking forward to kicking on again. “We need to get that spark back. We need a couple of good results to start climbing the table and hopefully we can pick them up against Redcar and Berwick. 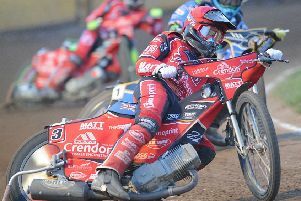 Panthers’ poor recent run has seen them slide to eighth in the SGB Championship standings and they find themselves nine points adrift of the play-off places. But they have plenty of reasons to be optimistic about slashing that gap in the coming days. The city side have reeled off three successive victories at Redcar, including a 46-44 verdict in a KO Cup preliminary round clash earlier this season. And they’ll also have high hopes of sinking basement side Berwick, who are struggling with injury problems, on their own East of England Arena shale. That meeting is likely to provide new number one Harris with a first home outing since his return to Panthers 14 years after his previous spell with the club. Johnson added: “Redcar is one of our happier hunting grounds. It’s a place that tends to suit our boys and Chris actually holds the track record there. “It’s going to be a tough meeting because Redcar have put together a strong side this season, but we’ll go there with the intention of picking up points. “And I can’t wait for a home meeting on Sunday. It’s almost a month since we’ve ridden our track and hitting top form at home is going to be important. It will also be fantastic to see Chris racing at the Showground again. It’s a track he loves and one where he tends to pile up a lot of points.